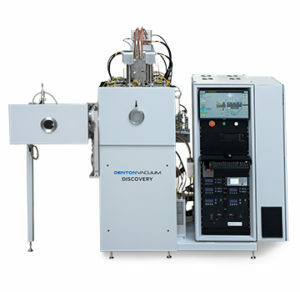 The Discovery Magnetron Sputtering system offers versatility and reliability while meeting high-volume production needs. The system can either accomodate a single cathode high uniformity configuration for high-volume manufacturing, or up to 4 confocal cathodes with triaxis adjustment of offset, target to substrate distance, and angle for uniform coating. Each cathode can be optimized for a different deposition method or target material. The Discovery system is standardized with a fully automatic mode with one-push button automation to reduce system downtime. It is integrated with a customizable cluster configuration to meet specific process demands for high-volume manufacturing. Semi-manual mode and other front-end options are also available for less demanding throughput needs. All Discovery systems ship with ProcessPro-HV for high-volume needs; this software uses a fully automated material scheduler to load the module with maximum efficiency. The user interface is SEMI 395 compliant with secure, multi-level access controls and visual system configuration and status indication. ProcessPro HV also features comprehensive data logging and custom charting within the tool. The production-proven Discovery platform can handle substrates up to 300mm. The cluster configuration makes it suitable for multi-layer, oxygen-sensitive applications and high throughput requirements. The platform accommodates DC, pulsed DC, and RF sputtering, which feature the single-cathode configuration for high uniformity, as well as confocal co-sputtering capability. Denton’s proprietary PEM technology enables high rate reactive sputtering of metal oxides and nitrides. Ion assisted deposition is also available. With independent electro-pneumatic source shutters and chimney assemblies, you can prevent cross-contamination of your source material. Multiple pump configurations, including cryogenic and turbo, as well as pump placement options provide the design flexibility we need to meet your process and productivity requirements. Single chamber, single wafer load lock: This is the simplest front-end option, allowing one wafer or carrier at a time to be loaded into the system. Single chamber cassette load lock: A more sophisticated option, providing a cassette of up to 25 wafers or carriers that a robotic arm loads into the process module. Cluster tool: This is the most robust option. It provides multiple chambers for coating and conditioning, as well as multiple load locks for loading wafers into the system. Learn more about the Versa, Denton Vacuum’s own cluster platform.